This dual-purpose video format converter is designed for converting regular composite video or S-Video signal into standard component YUV video or legacy RGB type for display on TV, projector or analog multi-sync type RGB monitor. Even though regular composite video takes only one wire to carry the video signal, the output picture quality can not have all color information presented sufficiently and lack of details. 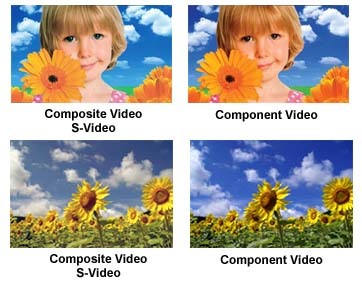 This video converter helps you restore the composite video signal back to the original 3 component RGB types with all color information being cleanly separated again so the final video on the screen will be crisp and clean pictures with vibrant and rich color accurately presented as they would have been during the studio production. Very suitable for all professional and home entertainment uses. Easily upgrading your home entertainment systems to high resolution output with this innovative device. This video converter is also served as a handy video gadget to help users streamline their home A/V setup or CCTV surveillance applications. Video format conversion is all done automatically. Stand alone hardware solution. Plug and play without any manual adjustment needed. This CV SV to component YUV RGB converter has 1 RCA connector for regular composite video input and 1 S-Video input. Video input selection is easily done via the push button on the converter. Two selectable video output formats, component YCbCr and RGB with sync on green type, are available using the dip switch on the side of the converter to achieve the desired video conversion for the application. This RGB video processor converts any standard video output from VCR, DVD player, satellite receiver, game console and so on into component video type at 480i or 576i for HDTV or other HD monitor displays through the 3-RCA component video cable connection. Enjoy the vivid color information with full color depth being presented by the new component video format showing on your big screen TV or projector. By using this video format converter, you can also streamline and manage your existing A/V equipment setup by connecting the composite RCA or S-Video type equipments to video receiver or switch with component video inputs. This analog video converter is also a great sync-on-green (SOG) adapter when using RGB monitors for video display. It converts any standard composite video or s-video signal to 15Khz RGB (RGsB) type output signal for legacy RGB monitor or workstation terminal with RGB input. If your RGB monitor requires the sync pulse to be combined with the green component signal (Sync-On-G), this converter can help you use such monitor or projector for video display. Or you may use this video sync converter for connecting standard composite video from video camera, game console, etc. to SIG, SUN or other graphic workstation monitors and enjoy the sensational visual entertainment on high-resolution RGB monitor. As the new flat panel screens/HDTV monitors gets bigger on the screen sizes and cheaper in prices, many CCTV surveillance systems can also be benefited by using the big-screen display for the setup. This video format converter provides the CCTV industry with a rightful solution of replacing the traditional security monitors with the new flat panel LCD TV screens for display. This converter can convert the video output from surveillance CCTV camera or surveillance DVR system into colorful component RGB video for display on big screen flat LCD TV or high resolution RGB monitor through the component video input or RGB terminal connection. Auto detection on the input video standard from worldwide video devices for. This RGB video converter is also ideal for daisy chain connection with other component RGB video switchers, splitter, repeater and receivers for large-scale display pool and setups. Dual-purpose composite video to YUV/RGB converter with selectable component video output and 15Khz RGsB output. Converting standard composite video or S-Video signal into interlaced component YCbCr video output at 480i/576i for TV or projector display. Converting standard composite video or S-Video signal into RGB at 15.625Khz/50Hz or 15.734Khz/60Hz ouput for RGB monitor display. Restores analog video feed to component/RGB type video with all the vibrant and rich color information accurately presented again. Crisp and clean output with full color depth via component/RGB format. Great video adapter for connecting CCTV video surveillance camera system or DVR, quad processor or video multiplexer to component video or RGB video for large screen display. Premium SOG video sync adapter for monitors requiring RGB sync on green type for the input. Daisy chain with any component video or RGB video switcher, splitter, distribution amp and HD A/V receiver. Automatic video input system detection for NTSC/PAL/SECAM devices. Supports worldwide video system including NTSC3.58, NTSC4.43, PAL, PAL-M, PAL-N and SECAM. Selectable composite video/s-video input via manual push button. Selectable video output format between RGB and interlaced YCbCr. Supports auto power saving mode.